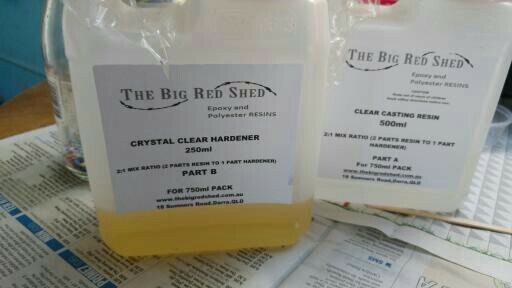 The resin and hardener that came in my kit. Too short pencils, beads and glitter, my test embedding materials. 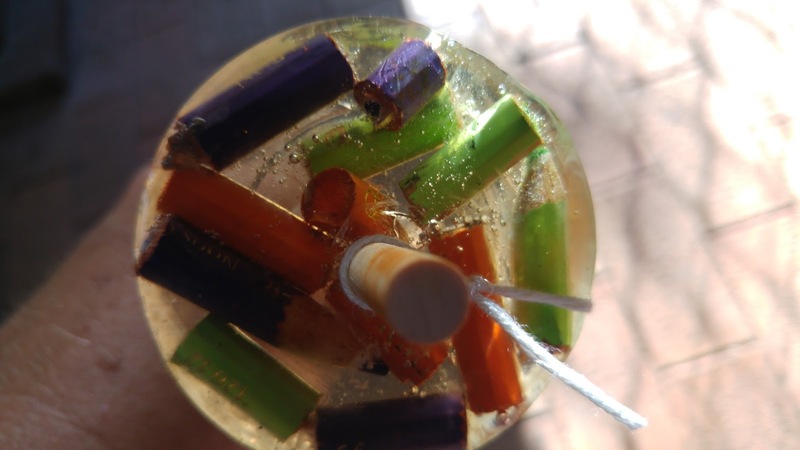 Resins all have a two part mixing system; you add a chemical hardener to a resin base to make a liquid which will harden to a solid over time. The time it takes to harden varies wildly due to resin type (there are three main types), brand (many, many brands) the weather (faster setting in hot weather) and quite possibly the way you hold your mouth while mixing it (from my own experiments). My kit said to mix two parts resin with one part hardener, all the kits I looked at had a different ratio or measurement method; some measured by volume, some by weight, the one I bought measured by volume so it was easy to do. Epoxy resin (which is the kit I bought), has a long pot life, meaning it takes a while to harden once the resin and hardener are mixed together, this allows me to fuss around with it quite a bit. My first step was to find a few molds to hold the resin while it sets. I had a couple of pendent molds and a set of ring molds that I bought on a whim so I dug those out of the overflowing craft room. 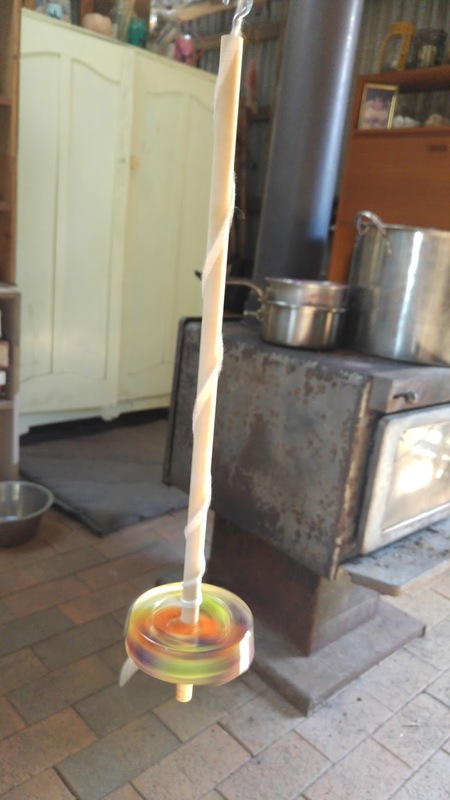 I also found some round takeaway containers that had formerly held tartar sauce; these little beauties sparked the idea of making spindle whorls because they were exactly the right size and depth. 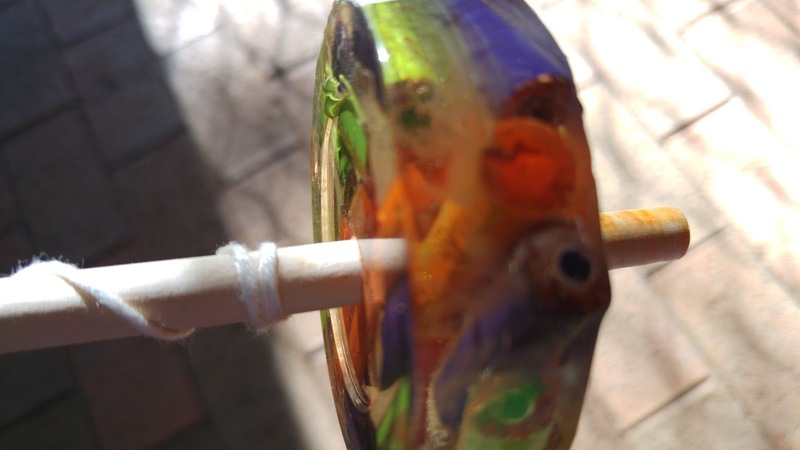 So I now had a project in mind…resin drop spindles. 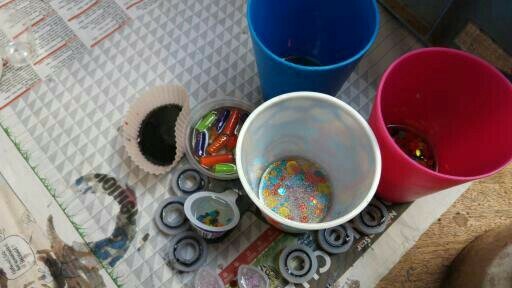 Second step was to prepare all the junk to be embedded, I just cut up some pencil stubs and mixed some glitter and stuff. I collect the pencil stubs from work (schools use a huge number of pencils every year and when they are too short to be sharpened again they are thrown out, unless I’m there), the glitter and bits were saved from craft activities I had done with my daughters in the past. I then mixed up my resin and hardener; this took a while as you have to make sure the two are well combined then wait for the bubbles to clear, it took about five minutes to do this part. Third step was to pour the resin into the molds with the embeds in them. I made some spindle whorls with pencil stubs, glitter and beads in them. 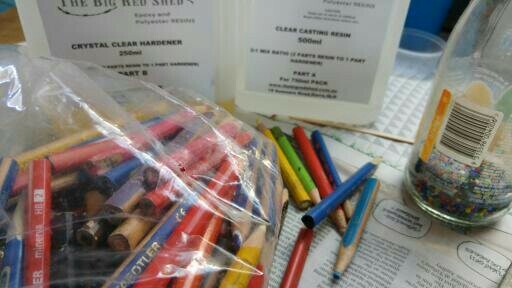 That is one of the little takeaway pot filled with pencil stubs beside my resin ready to be poured. Some filled molds, yes I did spill some resin and make a HUGE mess of the table. 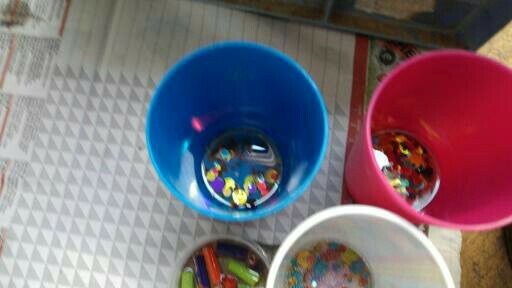 The little round things are the ring molds. 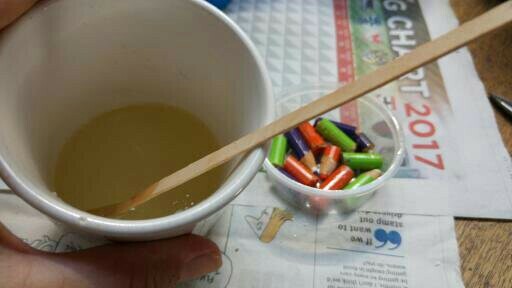 I tried the bottoms of plastic cups as molds too. The next morning….after the resin had all set I took everything out of the molds. Only breaking one whorl in the process. I also scrapped up all the bits of resin left sticking to the table after I spilled one of the molds. It had embedded the newspaper onto the table top (luckily nobody here notices a new scar on the table) but it peeled off eventually. I ended up with three usable whorls, five rings and a couple of pendents. I borrowed my partner’s drill and drilled some holes in what I thought was the middle of the whorls. As it turns out they are all slightly off center due to my poor measuring skills, but that has worked to my advantage as the finished drop spindles keep spinning for much longer than my more balanced ones (that was a happy accident). 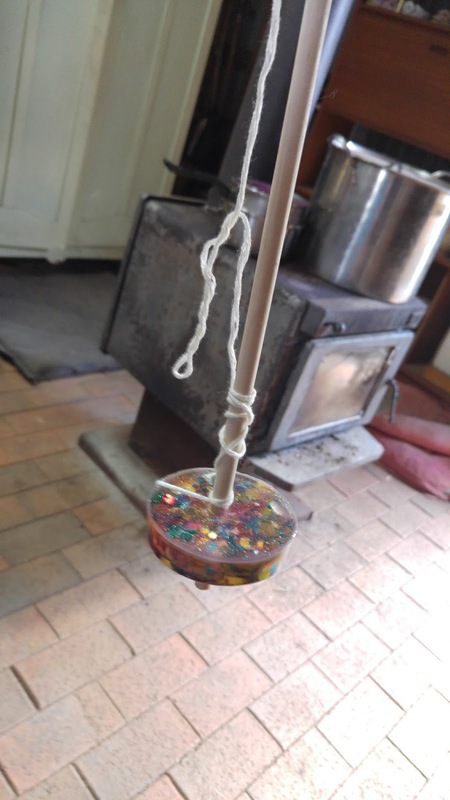 I stuck some dowel through the holes and screwed in a tiny little cup hook at the end, I also strung them up with a leader thread so I could test them. All the pieces I made had to be sanded down to get rid of any sharp edges or lumpy bits, but it didn’t take too long. I just used the sanding attachment on the drill. They work really well and look kind of pretty too (at least I think so). I will be selling these little spindles at the next market stall, or maybe on Etsy. 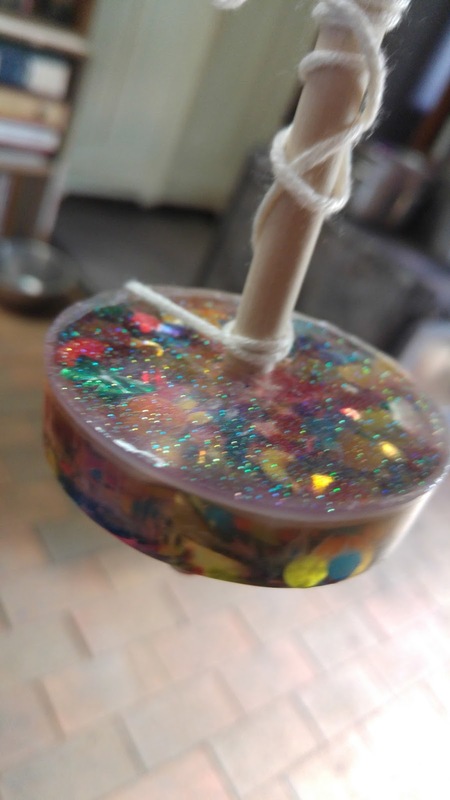 Making resin whorls was so much fun I just might include it on my list of permanent craft activities. It uses up all those little bits and pieces of stuff that I seem to collect, like too short pencils and a half cup of mixed glitter. 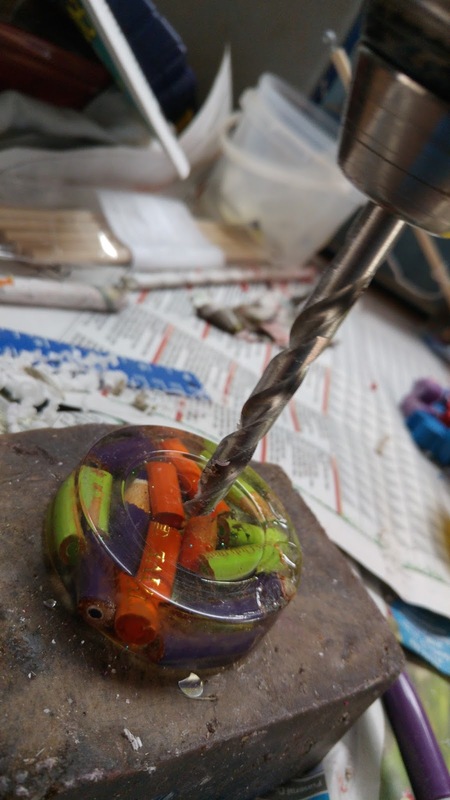 It makes a surprisingly beautiful whorl for a drop spindle and it’s a lot of fun…on the down side though, it can make a mess, it’s basically plastic and needs constant purchases of resin and hardener. Still…it is a lot of fun. I will post pictures of the rings I am making in another post. I’m trying to figure out how to embed fabric scraps and feathers into rings and bangles.